PALU, Indonesia (AP) — “Awesome Indonesia,” a young man shouted sarcastically as a crowd of people, some pushing their arms elbow deep into a jumbled pile of sodden food and debris, searched for anything edible in the shell of a warehouse that tsunami waves had pounded. Clambering over the reeking pile or staking out a patch of territory, the people pulled out small cartons of milk, soft drinks, rice, sweets and painkillers. One man digging out packets of biscuits had half submerged himself in the mess. 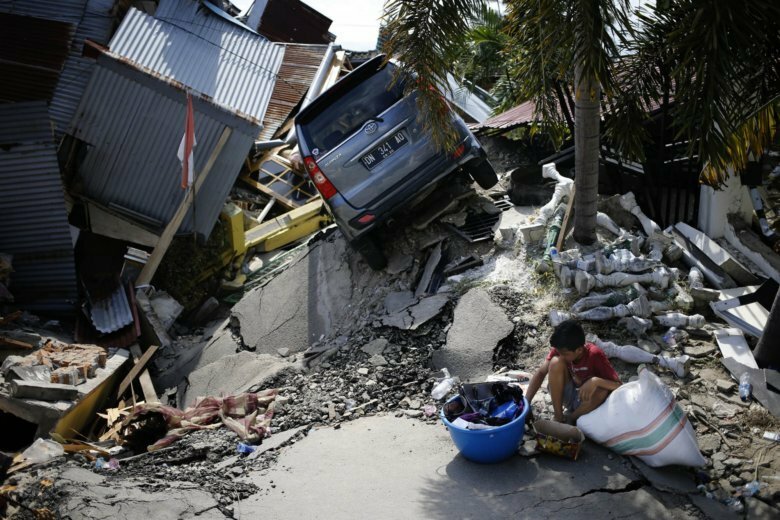 They had come from devastated neighborhoods and elsewhere in the remote Indonesian city of Palu, which was hit by a magnitude 7.5 earthquake and powerful tsunami on Friday. They were young and old, middle class and poor, university students and sullen young men. She pulled out a prize — a packet of red rice wedged beneath a plank. She’d come from Balaroa, a neighborhood of several hundred houses in Palu that was turned upside down by the quake and where residents still remain buried beneath the rubble. Officials say more than 1,200 people were killed in the twin tragedies that hit Palu and the surrounding district of Donggala on Sulawesi island. The death toll is expected to rise. Search and rescue personnel are overwhelmed by a multitude of hard-hit areas, including a neighborhood that was swallowed by the earth when the ground liquified during the quake. Aid is only trickling in, and five days after the disaster, the region remains without power. Indonesia, in a rare move, has appealed for international help. President Joko “Jokowi” Widodo visited Palu for a second time Wednesday, viewing a collapsed hotel where search and rescue workers are still searching for victims. The focus on the hotel has angered some in Palu, who wonder why their own neighborhoods, such as Belaroa, are being neglected. Aid being distributed in Palu on Wednesday included red and white bags — the colors of the Indonesian flag — marked as being supplied by the president’s office. A stretch of Palu’s coastline once occupied by warehouses, but now a tangled unrecognizable mess, was being picked over by hundreds of people for anything salvageable. People carried away corrugated iron, wood, pipes and other materials, hoping to build shelters or sell them for cash. Furniture maker Khairul Hassan said he was working nearby when the quake hit and ran to hills behind the warehouses. He said he saw women and children swallowed by the tsunami waves and trapped warehouse workers swept out to sea. In the shells of a row of buildings still standing, word had spread that there was a cache of food, and dozens milled about. Fifty-year-old Rosminah sat on the pile, a plastic shopping bag bulging with muddied packets of food next to her, chatting as she picked through the debris. Outside, Sofiyan, a farmer, was guarding an icebox and buckets stuffed with bottles of syrup, condensed milk, engine oil and pest killer. “We really need fuel for a generator so we can boil water for drinking and washing,” he said.